GASTROPUB?! Oh no no no. Afternoon tea should be about luxury. Exactly! I wasn’t impressed since it was a special treat for my 40th. Actually, the whole reason we put the (and sometimes London) in our name was so we could blog about them, though we haven’t got around to it yet. I went for breakfast and loved the room, though didn’t enjoy being stuck out in Siberia in a weird little half room. The sandwiches look lovely. Whaaaaa? Weird little half room?! That’s not good. Chutney is a bad thing? What planet are you from?? Ahhhh … I could taste the sandwiches as I was reading. Missed the scones and clotted cream. Where there any? I have to say the afternoon tea as the Grosvenor in Mayfair was pretty darned special too. 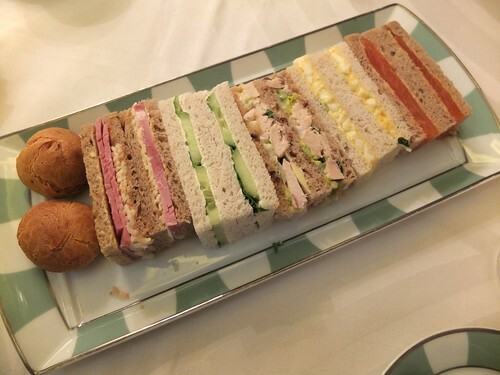 Same thing – as many sandwiches as you could want (even offered some AFTER the cakes to give a carb comedown after all the sugar…) and of top notch quality. Sandwiches AFTER the cakes?! This is radical! I am liking the sandwich book ends idea very much indeed.